In our house while we deck the halls or wrap the gifts Christmas Music has to be playing. It just sets the mood! I have a great album to share with you today from Rocknoceros - Happy Holidays. Washington, DC's award-winning power trio for kids and families, Rocknoceros, continues its 10th anniversary celebration in high spirits with the November 24 release of an exuberant holiday album, Happy Holidays from Rocknoceros. Rocknoceros - Performance Highlights - Nov. - Dec.
Visit the Rocknoceros website HERE. This is a fun album taking us on a journey from Halloween to New Years with a variety of holiday songs. The holidays covered are Halloween, Thanksgiving, Hanukkah, Christmas and New Years. I just love that Rocknoceros has songs for them all. How awesome is it that you can pull this album out in the fall and listen all the way through to January! I love the renditions of the songs they chose. It has a lite rock feel that is just perfect for family activities during the holiday seasons. 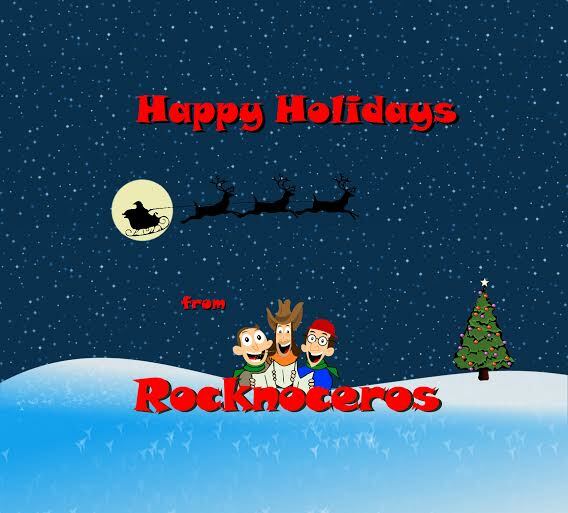 One lucky Reader will win a copy of Happy Holidays from Rocknoceros!